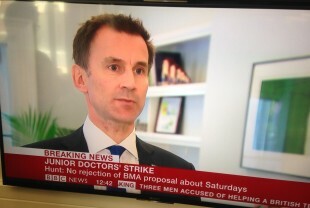 He rejected claims that the BMA had submitted cost-neutral proposals for a new junior doctors contract which could have resolved any outstanding issues. Figures show that turn out for the strike is slightly lower than last month, with 43% of junior doctors in work today. Mr Hunt thanked all of the junior doctors who did turn out for work today and said he hoped a resolution could be reached as soon as possible.